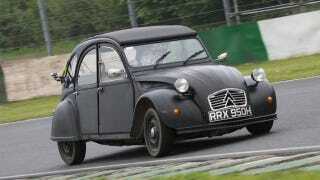 The Citröen 2CV is an entertaining steer, even with half the ponies of your lawnmower. But swapping in a 95 horsepower motorcycle engine makes it pure lunacy. And we love lunacy. The swap comes courtesy of Sparrow Automotive in the UK and involves strapping a BMW boxer in place of the original two-pot. Sparrow says any flat-twin R-Series engine will work with a standard 2CV chassis and no modifications to the body work, and the most popular sizes are either the 850cc or 1200cc. For its first prototype, Sparrow went with the big boy pulled from the 1100S, and with a curb weight of only 1,500 pounds, the crew claims it's good for a top speed of over 100 mph and a 0-60 time under 9 seconds. Oh, and it revs to 8,500 rpm. But what's even more insane is Sparrow's initial test at Mallory Park outside of Leicestershire. The builders wanted to test the 2CV's original brakes, suspension, steering, gearbox, and clutch with the new mill. The death-defying results speak for themselves, but Sparrow's is doing even more – they've got a 125 hp version available.